Photograph from an album of 80 albumen prints taken by Eugene Clutterbuck Impey. Govardhan, 25 kms west of Mathura in Uttar Pradesh, is part of what is known to Hindus as Brajbhoomi (the area associated with the popular deity Krishna). Legend states that Krishna lifted the hill at Goverdhan with one finger, to protect its citizens from a deluge unleashed by the rain-god Indra. 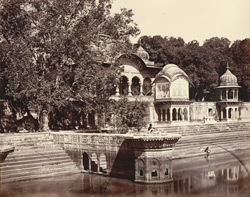 The finely carved chattris (pavilions) of the cenotaphs of the Jat rulers of Bharatpur are at the tank known as Kusum Sarovar here. Of special note is the cenotaph of Raja Suraj Mal (ruled 1755-63), the greatest of the Jat rulers, who was killed while attacking Delhi. The Jat chieftain Badan Singh (ruled 1722-55) had forged the Jat kingdom by uniting the members of an agricultural caste in the Mathura region. His son Suraj Mal, a strong leader who harried the Mughal empire in the anarchic period of its decline, consolidated the kingdom with its capital at Bharatpur and used the resources gained to build forts and palaces, the most famous being the palace at Deeg and the Bharatpur Fort. The interior of his cenotaph is decorated with paintings of court and hunting scenes.